Firstly, a little background to the event. Apparently 24 hour cycle racing started in the 1880s as a way of demonstrating the reliability of bikes, and as such that makes it one of the oldest forms of cycle racing. A 24 hour race is a masterpiece of organisation, with riders completing various repetitions of three separate circuits (dependent on how fast each rider is going), each of an exactly measured distance, and a method of establishing exactly where you were when your time is up on the finishing circuit by using several timekeepers at known distances around the circuit. All the rider has to do is ride in the direction they are instructed to and keep pedalling! 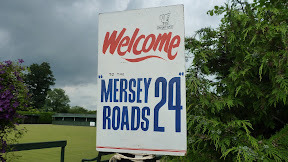 There is an interesting mix of riders taking part - 100 riders including men and women of ages ranging from 22 to 74 on either bicycles or tricycles, plus two tandems and a tandem tricycle! I have ridden one of these before, in 2005, but on that occasion I was riding just to see how far I would get, and spent 2hrs40 of my 24hrs not actually riding. This time it was a different ball game as I was aiming for a big target distance, and would have to both minimise time not riding as well as ride somewhat faster than before whilst moving. The key factors for success are: 1) being comfortable on the bike; 2) keeping hydrated; 3) eating; 4) pacing. If you get any of those wrong, then the wheels come off! I mention this now, as all of these came into play in my race. Of course you also have to be quite fit... and you have to be able to adapt during the race to whatever it throws at you! Small points learned from my previous 24hrs also proved invaluable - the little things really do add up. 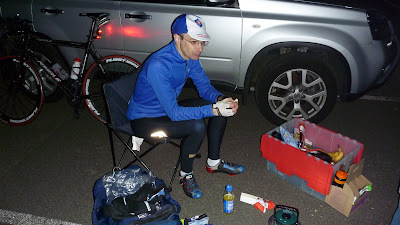 The night before the race I stayed in Widnes, about 45 minutes drive from the start. I had very little sleep as I just couldn't switch off (clearly not ideal when you're going to be up for the next 36 hours) and worse still I had managed to pick up a cold that day! But after 6 months prep a cold and lack of sleep isn't going to stop you riding. Arriving at the race HQ 2 hours before my start, we found an unbelievable array of camper vans and caravans for various other support crews that made our two cars look a little inadequate (though I should add that some riders compete without a support crew at all). After all the preparation it was actually a relief to get under way in the race. I was number 91, starting at 14:31, one minute behind the eventual race winner (who I never saw again that day! ), but more importantly 90 minutes behind the first rider to start. A little bit about pacing... The plan through my involvement with Cycling Weekly was for them to provide me with a power meter to train and race with so that we could establish the power output I could sustain and then ride to that level during the first half of the race, largely to prevent me from setting off too quickly. Sadly, they never managed to provide the kit, leaving me to judge pace purely by my heart rate monitor. The plan therefore changed to ride at a heart rate of 130bpm, which would have been fine had I not picked up a cold the day before, and within 10 minutes of starting it became clear that 130bpm would not deliver the speed I was achieving at that rate in training, and would therefore be insufficient to achieve my target. What's more, I didn't know how much my cold was affecting my heart rate so left me with no accurate way of determining exactly how hard I was riding. I mentioned adaptability earlier, and here we were 10 minutes in and the plan had to change already. The only backup was that I had established the time I needed to hit 100 miles in, and the distance at 12 hours, in order to achieve 400 miles in 24 hrs, so I set about trying to ride to those intermediate targets. I should say that the weather for the weekend was perfect for the event - 19C and very little wind on the Saturday, obviously cooler overnight (but not cold), and a little overcast most of the time so not too much sunshine. The course from the start heads roughly south for 35 miles. It isn't entirely flat, but having lost any accurate measure of effort, the problem was determining whether what felt like a headwind really was, and there was no way to be sure until turning round after 35 miles. 20 miles in was my first point to take a water bottle from my support team, where the photographer from Cycling Weekly was present, along with one of my team who was taking video clips - so no pressure not to drop the bottle then (you'll see that moment on the video) especially as they had picked a spot where I was doing somewhat more than 20mph. On reaching the turn at 35 miles it was a relief to find it was marginally easier heading north. I was on target in terms of time / distance, but a little worried that I felt I was working harder than planned, and somewhat unsure if it could be sustained for another 22 hours! 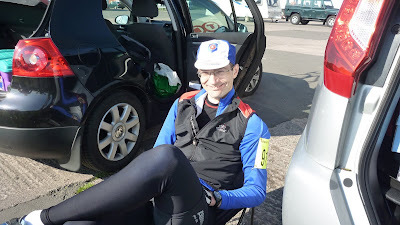 50 miles came and went in 2hrs37 (bang on target for 100 in 5hrs15), and I was picking up either food or drink from my crew nearly every 10 miles. 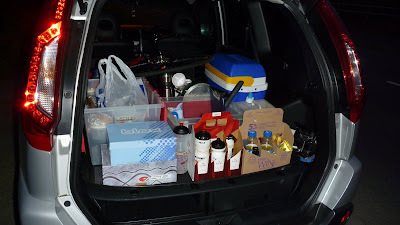 The plan was to drink 500mls of energy drink every hour, plus either an energy bar or two gels every hour (with occasional bananas for a little variety). The Saturday afternoon is an opening leg of 15 miles followed by two 20 mile out and back legs (40 miles per lap) for all riders...or so we thought! On heading south during my second 40 mile lap, the organisers turned me back north half way (due to me being at the back of the field and not quite being as quick as some of the others) leaving my support crew 5 miles further south whilst I headed in the opposite direction. Fortunately I had food and drink on board, but having ridden another 10 miles and then started around the next circuit of 12 miles I took the opportunity of a brief comfort break to phone my team, who had by then realised and said they were on their way and would overtake me shortly (cue concern they would pass whilst I was behind a hedge!). Back on track with our original plans for feeding points, the evening was spent completing 12 mile circuits on largely quiet country roads. 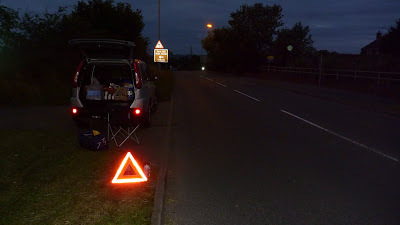 It was a beautiful summer's evening, and many support teams had set up barbeques at the side of the road! The rider's support crews at this event are fantastic and applaud every rider going past. One crew even had a cowbell that was rung vigorously for each rider as they passed. Alan and Quentin were stationed at the main roundabout for the event, and I was able to pick up food and drink each lap. After just over 2 laps the 100 mile mark was reached exactly on target in 5hrs15, which is an average of 19.2mph. One lap later it was time to stop for my first real break, with the chance to sit in a chair for just over 5 minutes whilst lights were fitted to the bike ready for nightfall. Quickly back on the road I managed to squeeze another 2 laps of the 12 mile circuit in before darkness, and by a quirk of fate I was one of the last riders to turn out onto the night time course which was to repeat the afternoon 40 mile laps through until 7am. Alan and Quentin had moved along the course and had with them a car warning triangle and red light so I could see where they were. The first layby they chose was not where I expected to see them, and whilst I spotted the warning triangle, they couldn't identify me until I had gone sailing past! Plans were quickly adapted and they soon caught up and established a strategy of feeding locations that worked throughout the hours of darkness. The hours of darkness were wonderfully peaceful, and what little wind there had been completely disappeared. I had expected to be slowing from 19mph to 17mph at nightfall, but every time I glanced at my speed it was still showing an average of 19mph. At 11pm I stopped for my night time clothing - warmer socks, leg warmers, and a thicker long sleeved top - it wasn't that cold, but it was best to put warmer clothing on before I got cold. Stopping for just under 10 minutes, and with about 150 miles covered, I had only been off the bike for 15 minutes in total, and everything was on track. The front lights on my bike were amazing - as good as riding with a car headlight - and this removed the problems I had 7 years before where I was unable to take my hands off the bars to eat during the night. In fact, riding in the dark was quite enjoyable as all distractions were removed, and the repetitions of the circuit were not so tedious. The only benchmark I had to aim for at this point was 216 miles in 12 hours, and I was constantly checking to see if I was on track. 200 miles came and went in 10hrs 54, giving a split time of 5hrs39 for the second hundred, but removing the 15 mins of stops was a very respectable 5hrs24 on the back of the first 100 in 5hrs15. And it meant I had time for a 10 minute rest and still hit the 12 hour target. Getting back on the bike after such a long distance takes a minute or two to get properly back up to speed and into your rhythm. On rides this long there are constant aches and pains which come and go - from the pain in the arch of my right foot by 100 miles which disappeared with the thicker night time socks, to the pain in my right knee when trying to get out of the saddle around the 120 - 130 mile mark, but which just vanished after another 20 miles. You get used to the niggles and get on with the riding in the knowledge that usually the discomforts disappear to be replaced with others! This far I had been relatively blessed with no hint of back or shoulder pain and a settled stomach, which has been my downfall in many previous endurance races. 225 miles saw my first stomach issues of the race. Hydration is a major factor in racing this far, and whilst I had been sticking to the planned 500ml per hour, the warm temperatures during daylight had clearly taken their toll. When dehydrated it makes it so much harder to eat and keep food down, and you feel generally sick. I was starting to question my ability to complete the 400 miles, and was tempted to take another quick rest at the 235 mile point. But that in itself would put me behind schedule, and you just can't afford to stop every 40 miles and hope to set a record. Fortunately I was sharp enough to realise it was a hydration issue and I asked Alan for a different drinks bottle at 235 miles with an orange drink instead of my energy drink. Forcing down an energy gel to keep me going, I also forced myself to drink the whole bottle in 10 miles before taking on more energy drink. This did the trick and within 10 miles things were turning around in my favour again - another lesson from previous events that everyone has bad spells and you can ride through them. Even better, the bad spell had lasted less than an hour! It was daylight now, which is a major milestone in this race, and there were some sights to be seen back out on the road with several riders lying on the grass verge for a sleep! I hadn't felt the slightest bit sleepy throughout the night, and was still wide awake as I headed down to Telford and back for the last time. It was good to know that I was headed towards the circuit used the previous evening once again. It was after about 290 miles that things started to go wrong, and very suddenly! I mentioned earlier that pains and discomforts come and go, and within reason you just continue and they tend to go away. Maybe I had missed the warning signs amongst the other niggles, but I found myself constantly standing up to accelerate, to sit down, then freewheel before repeating over again, and it became apparent I was having trouble actually sitting on my saddle. After another 5 miles or so I was relieved to find Quentin back at the main roundabout and I knew I just had to stop for a break. 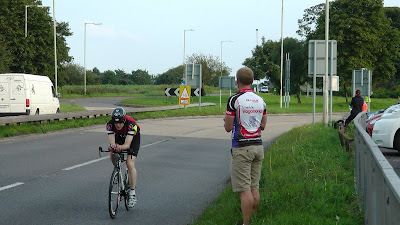 My speed had suddenly declined, and my stomach was also a little dodgy, and a quick sit down had become a necessity. At this point Quentin was fantastic - as a rider after 17 hours you may not entirely be thinking straight, but Quentin was the voice of reason and had me back out on the bike for a first 12 mile circuit. 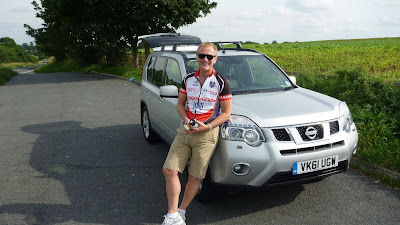 It was quickly clear to me that things were no longer going well - even flat sections of road were proving difficult, and once again I couldn't stay seated for very long at all before freewheeling, then getting out of the saddle to accelerate again. This just wasn't sustainable and this played on my mind thinking how you wouldn't set out to ride 100 miles in 7 hours if you couldn't sit on your saddle, let alone having ridden 300 miles already. With the circuit completed in one hour it was some way short of the 15mph I needed to continue on track for the targeted 400 miles, and I knew in all honesty that the attempt was over at that point. Niggles and discomforts you can deal with and ride through, but this was just too much to continue with. On reaching Alan and Quentin I rode in to the back of the car park as I knew there was no way they could persuade me to continue. I recall at the time Quentin asked if I would regret later not taking a longer rest, then continuing to see how many more miles I could add in the remaining 6 hours. I hold no regrets for stopping when I did. I set out for the club record, and there were no prizes for being slightly closer or further away from it. Going back to the first 10 minutes of the race when I lost all my pacing references, I made the decision to ride for the record regardless of how hard I was having to ride to stay on schedule, and the risk I knowingly took was of not finishing - I was either going to take the record or not finish. 311 miles may sound a long way from 400 miles, but at 299 miles in 17 hours I was bang on schedule, and in reality I was very very close to a successful attempt. So, what ultimately caused the failure? Well, on washing my shorts the next day I discovered there was an indented logo at the rear of the padding in my shorts that said Pro Gel, and this lined up exactly with a friction burn. These were the shorts I had undertaken all my training in and had no issues with. Clearly it had been causing friction for 17 hours until the point that it was no longer tolerable. As I said earlier, the smallest things make all the difference! 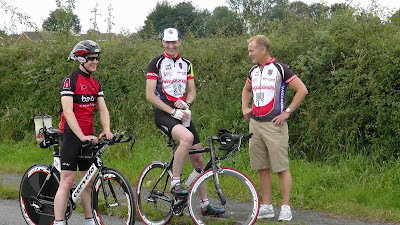 I've been surprised to find so many people saying what a great achievement it was to ride so far in the time I did - this from cyclists and non-cyclists alike. And I guess it is - it's the distance from Newcastle to London in 17 hours. I've really appreciated the acknowledgment I've received from so many people. And so the question that everyone has asked - will I try it again? I said before I rode that I wouldn't - if I broke the record I didn't need to, and if I didn't it was because I couldn't. However, I seem to have finished in between... I didn't break the record but I've proved I can ride fast enough to. I have no problem in taking part in a 24 hour again, but there is a huge difference between riding around and chasing the record - the only way to describe riding for the record is utterly relentless! But the training required to compete at that level requires a huge commitment and I'm not sure I could give it that commitment again. You'll have to wait and see!! Finally, if you ever happen to be passing through Shropshire one weekend in late July and you see a race in progress with large numbers of supporters at the side of the road, you'll now know what is going on. Stop somewhere safe and give the riders a clap - they will all apreciate it!